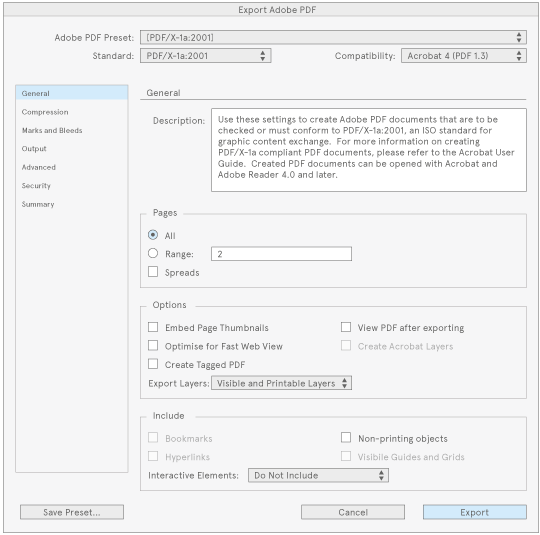 This is a guide to help you convert a newspaper designed in Adobe InDesign into a PDF ready for upload to Newspaper Club. 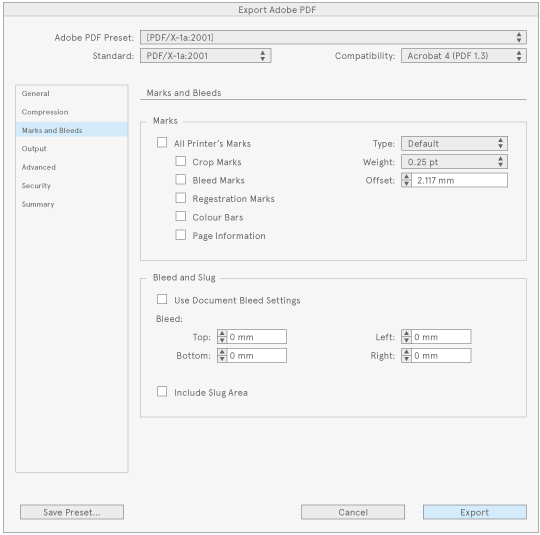 If you're not using Adobe InDesign to design your paper, we've produced some instructions that are common to every desktop publishing package, as well as guides for other pieces of software. 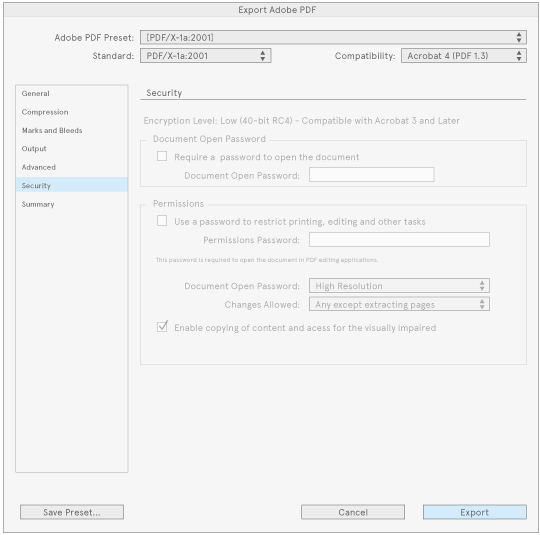 Make sure you're exporting a PDF/X-1a:2001 format file. 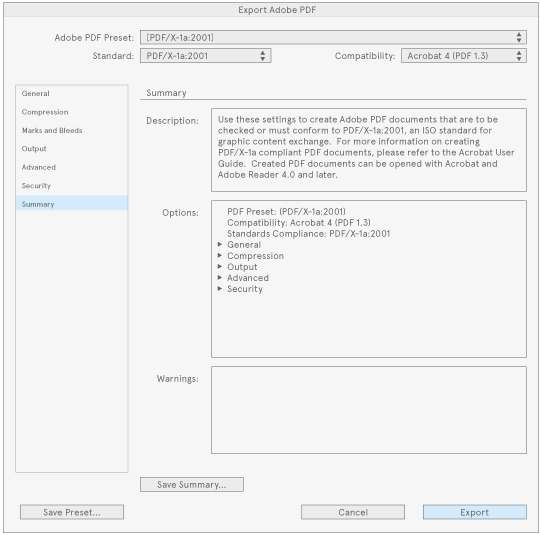 This is the simplest kind of PDF, and ensures that any advanced PDF features are stripped from your file, making it much less likely to have any printing issues. If you’ve selected this, then most of the following options should be set up correctly, but we’ll go through each of them in turn in the sections below. 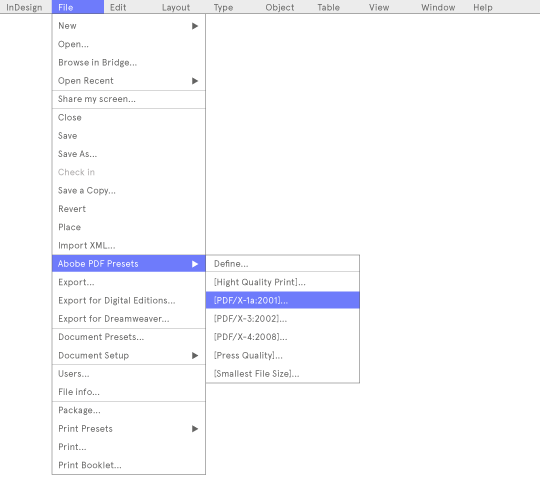 Pages: set this to ‘all’ unless there are certain pages you don’t want to print. Either way, we need the correct number of pages to ensure your newspaper is printable. Make sure ‘spreads’ is unticked. Options: untick all of these. 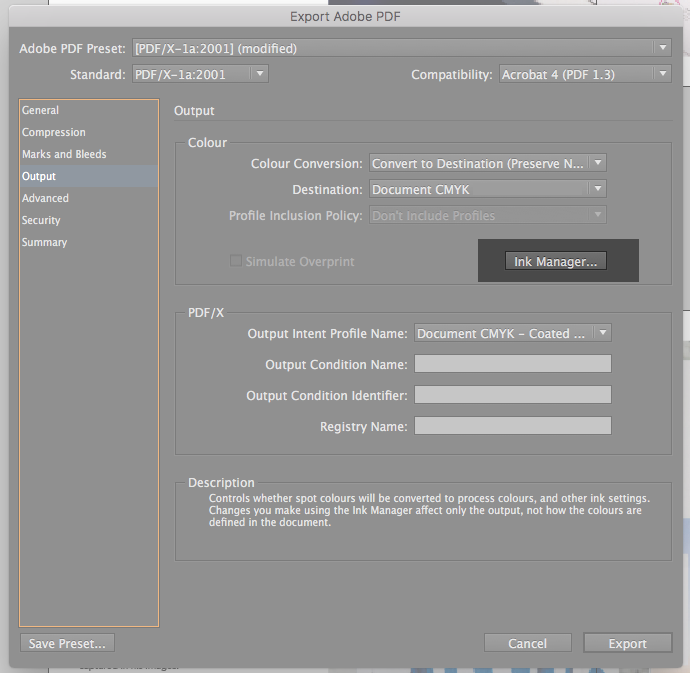 Only export ‘Visible and Printable Layers’. Include: make sure all of these are unticked, and ‘Interactive Elements’ is set to Do Not Include. 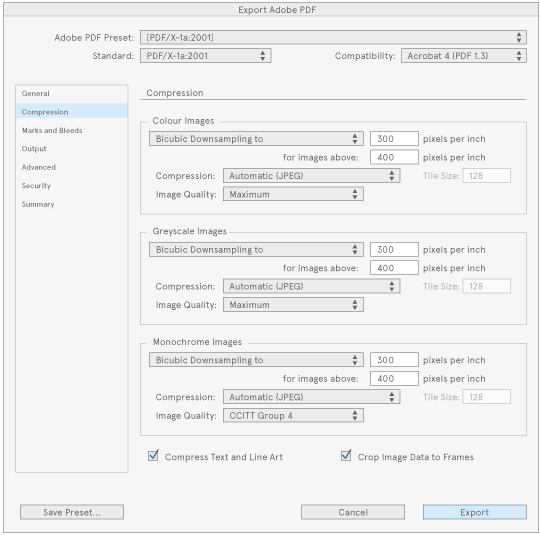 We recommend you set the image resolution to a maximum of 300 ppi — anything higher and you’ll make your file slower to upload, without any improvement in quality. Make sure all of these are unticked. 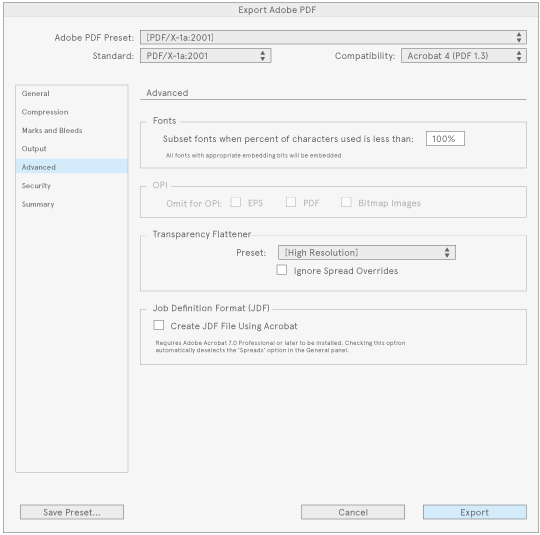 If you are exporting a Mini, tick ‘Use Document Bleed Settings’ to include the bleed area in your PDF. 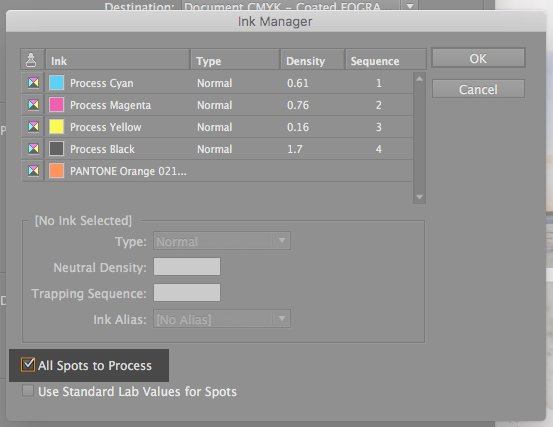 Select 'All Spots to Process'. Usually there isn’t anything in the Warnings box, but if you’ve used transparencies there might be an indication that they will be flattened.